There are now plenty of convolution reverbs around, but Prosoniq's Rayverb offers something a little different. So just what is 'inverse raytracing' anyway? Convolution reverb plug-ins are clearly in vogue at present. Recently, SOS have reviewed both Waves' IR1 (May 2004, see www.soundonsound.com/sos/may04/articles/wavesir1.htm) and Voxengo's Pristine Space (SOS September 2004), and the latest is Rayverb from Prosoniq. Priced between these two competitors, but close enough to Pristine Space to be affordable to those on a relatively limited budget, it's available for either PC or Mac, and provides a convolution-based reverb that can be used as a stereo insert or send/return effect. It is supplied with a small number of built-in room models and can also use impulse responses generated from other reverberant spaces — a selection is available for download via the Prosoniq web site. Aside from the convolution process, however, the unique selling point of Rayverb is something Prosoniq call 'inverse raytracing'. So what does a technology generally associated with computer graphics have to do with producing an authentic-sounding reverb? Raytracing is used in computer graphics programming to trace beams of light from the viewer's perspective of a scene back to the objects within that scene, allowing the colour and lighting of each pixel representing the object to be calculated. Understandably, this is computationally serious stuff, as demonstrated by the cutting-edge hardware specs required to run many modern computer games. Similar mathematics can be used to model sound waves, and when an architect is designing a room, its size, shape and materials can be modelled to predict the acoustic properties of the space. As the name suggests, inverse raytracing is the reverse process: for a pre-recorded impulse response, it tries to calculate backwards to identify the size and composition of the acoustic space the IR was recorded in and the position of a sound source within that space. Once these calculations are made, the room model created can be used to predict what the sound source might sound like if it was repositioned within the same reverberant space. While all sorts of simplifying assumptions have to be made along the way, this is essentially what Rayverb 's inverse raytracing allows you to do — reposition a sound source within the reverberant space represented by the particular IR being used. Rayverb 's controls are grouped into a number of sections. 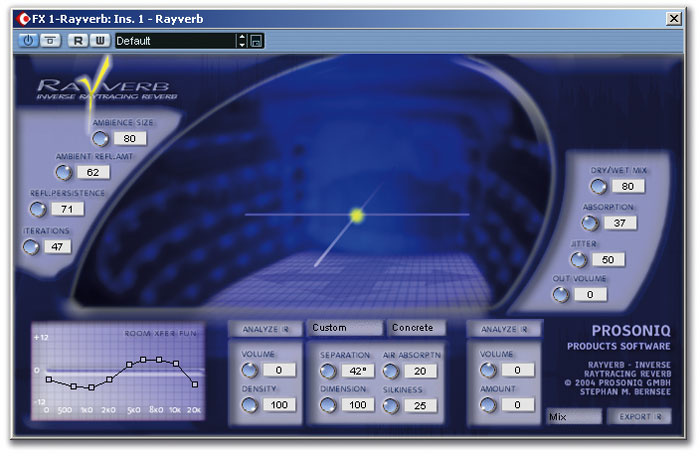 Selection of the IR is done in the bottom centre of the display, from where one of the built-in room models can be selected; alternatively, any other IR file can be loaded via the Analyse buttons, whereupon Rayverb analyses the IR via its inverse raytracing process to generate a reverb model of that space. The built-in rooms range from very small to very large and are intended as fairly neutral spaces giving a starting point for further editing. When using other IR files, the left Analyse button is the primary slot, but for extra flexibility, a second IR can be loaded via the right-hand button and these two impulses can then be mixed in various ways via the Mix control (bottom right). At present, Rayverb can only load IRs in the AIFF file format, and any WAV files have to be converted prior to use. The surface type can also be selected from a drop-down menu situated in the bottom portion of the display, with the options being concrete, wood, glass, carpet and tin. These alter the tonal characteristics of the reverb in fairly obvious ways. The Separation control adjusts the stereo spread of the model, while the Dimension control can scale the room model down from its original size if a smaller space is required. Both these controls have a marked influence on the resulting reverb and offer considerable flexibility. Air Absorption provides high-frequency damping while, according to the manual, Silkiness does the opposite. The former certainly produces more natural results and is particularly useful for damping down rooms with long reverb tails. Further tonal control is provided by the 12-node equaliser that is positioned bottom left. Because of the real-time calculations required, the raytracing process does not deal with late reflections. Instead, a generic ambience model is used to create dense late reflections that are merged with those of the IR model to produce a natural result, and the four controls positioned top left make adjustments here. The Ambience Size and Reflection Amount control the size and reflection intensity used in this ambience model, while the Persistence and Iterations controls determine the length and degree of reflectivity (higher values produce a brighter sound). The '2D' space within the centre of the display puts a friendly face on some quite clever processing. The yellow dot can be dragged around within this space — moving the dot along the 'Z' axis will make the audio source seem to be more or less far back within the room. Left-right perspective is also adjustable. This is a neat trick and does provide some additional flexibility in terms of placing sounds within a mix — although, of course, if you're using Rayverb as a send effect, the virtual position of every sound being fed to the plug-in is altered at the same time. The group of controls on the right deal with the overall output from Rayverb and, with the exception of Jitter (used to break up repeating reflection patterns within the modelled room to make it sound smoother), are self-explanatory. Finally, if you create a reverb model that you particularly like, Rayverb can export an IR file which could be used in another convolution reverb plug-in if required. Given the amount of number-crunching being done, unsurprisingly, Rayverb does introduce a processing delay — the manual says 9417 samples. Of course, most VST hosts (including Cubase SX on the PC, with which I did my testing) automatically compensate for this on playback, but it is unsuitable for monitoring while recording. Although I experienced a few very occasional minor glitches, the plug-in certainly behaved very well. On the test system, a single instance of Rayverb produced a CPU load of about 12 percent. I also have no complaints about the sound quality. The generic models supplied cover a range of room sizes and, when combined with the different surfaces available, it is possible to conjure a wide range of reverb types, from very subtle, warm ambiences through to massive cathedral-like spaces. The other editing possibilities extend this flexibility, although a little trial and error is needed to get to grips with how the various controls interact. Combining two IRs to produce a composite reverb also takes some experimentation but, again, adds to the creative possibilities. I used Sound Forge 7 to convert a number of the WAV-format IRs I regularly use with Pristine Space in order to do a direct comparison with Rayverb. As should be expected, when tested side-by-side with the same IR file, Rayverb and Voxengo's Pristine Space produced very similar results, although the additional 'ambience' processing of the reverb tails in Rayverb did create some subtle differences. Both are capable of remarkably good results, even when used with solo instruments or vocals where the reverb is very exposed. For me, Pristine Space is perhaps easier to get to grips with but Rayverb probably offers a wider range of ways to customise the intrinsic sound of the IR. There are, of course, other differences: while Rayverb is available for both Mac and PC, Pristine Space is PC-only, but it does also offer surround support, which might be a consideration for some. Essentially, the decision for particular users may come down to how tight the budget is, whether surround support is required, the platform being used and the degree of fine-tuning you like to do on your reverb sound. Fortunately, Prosoniq hope to have a time-limited demo available for download soon so users can evaluate the possibilities on their own systems. What is in no doubt, however, is that convolution reverb plug-ins such as Rayverb and Pristine Space are now bringing high-quality reverb within the reach of almost any budget. No surround sound support as yet. Rayverb is another excellent addition to the convolution revolution — high-quality reverb is finally becoming available to the masses!